Most breast cancer patients die due to metastases, and the early onset of this multistep process is usually missed by current tumor staging modalities. Therefore, ultrasensitive techniques have been developed to enable the enrichment, detection, isolation and characterization of disseminated tumor cells in bone marrow and circulating tumor cells in the peripheral blood of cancer patients. There is increasing evidence that the presence of these cells is associated with an unfavorable prognosis related to metastatic progression in the bone and other organs. This review focuses on investigations regarding the biology and clinical relevance of circulating tumor cells in breast cancer. Detection of circulating tumor cells (CTCs) in peripheral blood and disseminated tumor cells (DTCs) in bone marrow of tumor patients has become an active area of translational cancer research, with numerous groups developing new diagnostic assays and more than 200 clinical trials incorporating CTC counts as a biomarker in patients with various types of solid tumors. Among these activities, breast cancer has played the most prominent role as a 'driver' of research on CTCs/DTCs. The clinical relevance of DTCs is already well-established [1, 2] and has been confirmed by different large-scale studies, including a pooled analysis on almost 5,000 patients . Aspirations of bone marrow, a common homing organ for many types of solid tumors [1, 4], are part of the routine screening of leukemia patients and are much less difficult to perform than biopsies of other organs (for example, lungs or liver). Nevertheless, it is still a painful and invasive procedure that is not comfortable for patients and, due to this fact, has not yet been accepted for routine diagnosis of solid tumors. In contrast, CTCs are easier to obtain by peripheral blood sampling, which can be repeated frequently, allowing real-time monitoring of metastatic progression. Thus, it seems that peripheral blood might serve as a perfect alternative source of material to diagnose cancer patients, and CTC analysis in cancer patients has thus been termed a 'liquid biopsy' . On the other hand, detection of CTCs is hampered by the still uncertain biology of these cells, which most likely inherit a heterogeneous malignant potential to home and give rise to overt metastasis in secondary organs. Even modern technologies that have been applied to isolate and characterize CTCs still need to be improved . Although recent results on significant associations between the presence of CTCs and subsequent occurrence or progression of metastases are encouraging, the clinical relevance and utility of CTCs merit further investigation and confirmation by multicenter trials. Developments in CTC/DTC technologies over the past few years have been impressive. This review will recapitulate the current knowledge on CTCs in breast cancer patients with a focus on the biology and clinical relevance of these cells. During tumorigenesis subsets of tumor cells localized within the primary tumor might acquire features of invasiveness and motility and enter blood or lymph vessels (Figure 1). Mechanisms involved in this process are still under investigation; however, they are already reported to be linked to variable interactions between tumor cells and the surrounding stroma, including, for example, response to hypoxia and metalloproteinase-dependent invasion into surrounding tissue, (neo-)vascularization of a tumor , as well as gain of a phenotype revealing signatures of epithelial-mesenchymal transition (EMT) observed in at least a subpopulation of tumor cells with certain 'stemness' properties [8–10]. 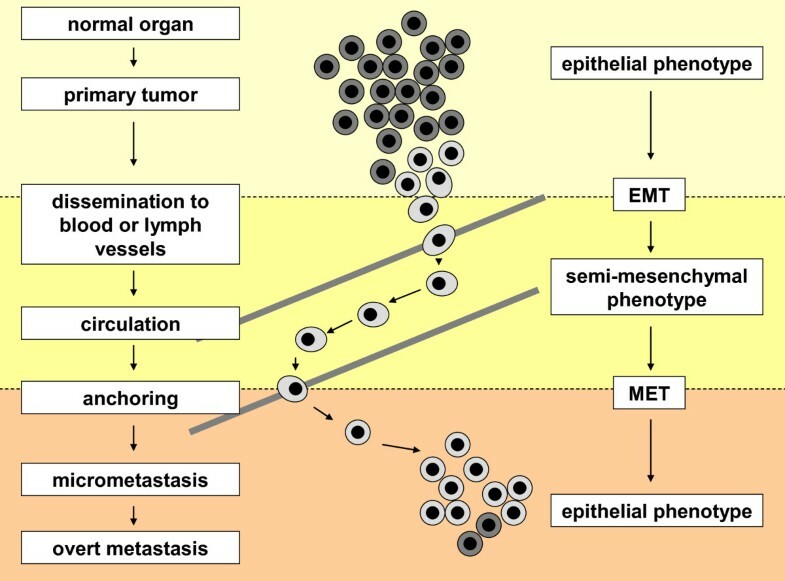 Phenotypic changes of breast cancer cells during dissemination and metastasis. Epithelial tumor cells that originated from a primary tumor might transform into more aggressive phenotypes and disseminate into the blood or lymph circulation. Due to this altered phenotype, which is frequently associated with epithelial-mesenchymal transition (EMT), their detection and identification in blood of cancer patients is significantly hampered. After surviving in the blood stream and homing to a secondary organ, tumor cells may undergo mesenchymal-epithelial transition (MET) and assimilate into the new environment of their secondary site (for example, bone marrow). This process will lead to the establishment of occult micrometastases that may eventually grow out to overt metastases detectable with current imaging methods. Once cells spread and survive, they might establish a separate secondary tumor site in a new environment of a host organ (for example, bone marrow, liver, lung or brain). CTCs/DTCs, however, can also undergo apoptosis or persist in an inactive, so-called dormant state for years . CTCs that extravasate need to survive as DTCs in their new microenvironment, which might be supported by finding and/or establishing a proper niche. These DTCs might transform into more aggressive variants and grow out to overt metastasis  and/or they may recirculate to other secondary organs or even back to their primary tumor site [12, 13]. Dissemination might appear in a late phase of tumorigenesis when a primary tumor achieves a critical mass of cells and gains a highly aggressive phenotype (linear model) or it might be initiated much earlier, even when a malignant tumor is still of small size (parallel model) . In the linear model subsequent events gradually lead to tumor progression, whereas in the concurrent parallel model CTCs/DTCs settle down in distant organs, creating a clone that evolves in parallel to a primary site. In both models occurrence of metastasis is usually fatal for a patient. CTC detection remains a big technical challenge despite the continued development of many new exciting technologies . The key problem is to define a technology that will detect the real metastasis-initiating CTC that will give rise to distant metastases. It is conceivable that this will be a combination of complementary technologies or even several technologies optimized for specific tumor types, including breast cancer. Some of the current key technologies for the enrichment and detection of CTCs are listed in Table 1. As CTCs occur at very low concentrations of one tumor cell in a background of millions of blood cells, enrichment is usually required prior to CTC detection. CTC enrichment involves a large panel of technologies based on the different properties of CTCs that distinguish them from the surrounding normal hematopoietic cells: physical properties (size, density, electric charges, deformability) and/or biological properties (surface protein expression, viability and invasion capacity). It is important to note that most of the current technologies are still based on epithelial cell adhesion molecule (EpCAM) expression (Table 1). However, due to the assumption that EMT may occur particularly during tumor cell dissemination and this might be accompanied by EpCAM downregulation, new emerging technologies also try to capture EpCAM-negative CTCs (Table 1). Abbreviations: Ab, antibody; BM, bone marrow; Cath-D, cathepsin D; CepC, circulating epithelial cell; CK, cytokeratin; CTC, circulating tumor cell; DAPI, 4',6-diamidino-2-phenylindole; DEP, dielectrophoresis; DTC, disseminated tumor cell; EpCAM, epithelial cell adhesion molecule; EPISPOT, EPIthelial immunoSPOT; ESA, epithelial specific antigen; FDA, Food and Drug Administration; FISH, fluorescent in situ hybridization; ISET, isolation by size of epithelial tumor cells; MUC1, mucine 1; NSCLC, non-small-cell lung cancer; PBMC, peripheral blood mononuclear cells; PSA, prostate specific antigen; RBC, red blood cell; RT-PCR, reverse transcription polymerase chain reaction; TG, thyroglobulin. As outlined in more detail below, an ideal CTC detection method might include epithelial markers not repressed during EMT and/or mesenchymal markers induced during EMT. Moreover, it is important to distinguish viable from apoptotic CTCs to detect and profile the most relevant metastasis-initiating CTCs. Finally, it is crucial to be able to analyze the captured CTCs at the molecular level and to compare their characteristics to those of the primary tumor and overt metastases. There is now strong interest in developing microdevices that can handle sample volumes at least ten times smaller than those required for current tests (<1 ml of blood versus 5 to 20 ml), thereby minimizing assay time and the use of expensive staining reagents. However, CTCs are very rare and the analysis of larger blood volumes (≥20 ml) might be preferable, particularly in early-stage cancer patients with a small burden of CTCs. Thus, technologies that can handle larger blood volumes still deserve special attention. The current CTC devices need to implement physical know-how and information on the biology of tumor cell dissemination, and intense clinical validation of these devices is required before their introduction into the management of cancer patients. CTC detection is possible at both early and late stages of cancer development and might allow estimation of the risk of relapse and survival. Yields of these rare cells range from one identified cell up to several hundreds of cells per blood sample. It is still under debate whether the presence of one cell might be clinically relevant and what CTC count thresholds should be used in order to establish disease-free or overall survival. Most research groups apply a prognostic cut-off of five CTCs as established by Cristofanilli and colleagues in metastatic breast cancer patients [15, 16]. Yields of tumor cells separated from peripheral blood are low in metastatic breast cancer but are still sufficient for further analysis; in early stages of breast cancer, however, these counts are even lower and frequently do not exceed five CTCs per 7.5 to 10 ml of blood . Identification of CTCs at this stage of disease is still a challenge. Nevertheless, the finding of even a single CTC in a blood volume as small as 7.5 ml was shown to associate with an increased risk for subsequent metastases [17, 18], which suggests that CTCs might metastasize more efficiently than deduced from animal experiments . Although most CTC studies are performed on subjects with metastatic breast cancer, CTC technologies might have the greatest impact on the treatment of patients without overt metastasis. CTC detection was proven to predict prognosis in clinically relevant subgroups of early-stage breast cancer patients [4, 19]. The still ongoing German 'SUCCESS' trial, which has enrolled almost 1,500 lymph node-positive and high-risk lymph node-negative but metastasis-free breast cancer patients before and after taxane-based adjuvant therapy, defined that at least one CTC was evident in 10% of the patients at the time of primary diagnosis before adjuvant therapy, and a significantly better prognosis was detected in the groups with persistently negative CTC status . Predicting patients' responses to therapeutic regimens is probably one of the most exciting applications of CTC technology. Consequently, several studies have suggested that the presence of CTCs that have survived therapy might reflect a failure of systemic therapy [21, 22]. Establishing that CTCs indicate progression during chemotherapy even 7 to 9 weeks before radiological imaging does so, Liu and colleagues  provided the first strong evidence that CTC tests might replace imperfect standard imaging procedures in the future. Maintaining less than five CTCs or decreasing CTC counts during therapy is considered to be an indicator of good response to treatment. RT-PCR-based detection of cytokeratin (CK)19 mRNA-positive CTCs after adjuvant therapy in early breast cancer patients was reported to be an independent risk factor for resistant residual disease . CTC counts in 115 non-metastatic breast cancer patients before and after primary systemic chemotherapy in a phase II trial (REMAGUS02) was an independent prognostic factor for shorter metastasis-free survival but did not correlate with pathologic complete response of the primary tumor to therapy [17, 25]. In the 'GEPARQuattro' trial, which included 213 non-metastatic breast cancer patients, the prevalence of CTC-positive patients dropped from 22% before to 11% after neo-adjuvant therapy and again no associations were found with primary tumor response . It has been suggested that CTC counts might depend on the form of treatment. For example, the humanized monoclonal antibody bevacizumab, which recognizes vascular endothelial growth factor A, combined with first-line chemotherapy modified the predictive value of CTCs during treatment of metastatic breast cancer patients, possibly due to impaired tumor-cell intravasation through blood vessel endothelium . CTC-based identification of early progression might offer the possibility of an immediate change of therapy instead of waiting for classic clinical-radiological evidence of progressive disease. Ongoing studies aim to answer the question of whether individualization of treatment decisions can indeed be based on CTC levels (for example, Southwest Oncology Group randomized trial SWOG S0500 on metastatic breast cancer patients , German Breast Group GEPARQuattro trial on non-metastatic breast cancer patients , and SUCCESS trial on non-metastatic breast cancer patients ). The first example of potential clinical benefit arising from a change in therapeutic regimen on the basis of CTC count is the case report on a metastatic breast cancer patient first treated with HER-2-targeting trastuzumab and subsequently with the dual epithelial growth factor receptor (EGFR) and HER-2 inhibitor lapatinib . Indeed, the change in therapy resulted in the depletion of EGFR-positive CTCs and response of the primary tumor. Tumor progression was related to recurrence of CTCs that were both HER-2 and EGFR negative, suggesting therapy-induced selection of target-negative metastatic cells. Though initial investigations have provided evidence that CTCs might be a promising prognostic marker, it is still unclear whether they provide the same clinical information as DTCs. To the best of our knowledge, comparative analyses of CTCs and DTCs have been performed in only a few studies. The yield of CTCs was estimated to be lower than that of DTCs  but this depends on the techniques used for CTC/DTC detection. Some authors reported that it reached greater levels only in bone marrow-positive cases [21, 33] and in high-risk patients . CTCs and DTCs are detected in individual patients at the same time with variable concordance rates (Table 2). Differences observed in some studies might be explained to some extent by the different technologies used to detect CTCs and DTCs. Interestingly, higher overall discordance of CTC and DTC counts was found in patients after rather than before adjuvant therapy , which suggests differential sensitivity of DTCs and CTCs to chemotherapy. In this context, it might be noteworthy that DTCs may express a set of stress response proteins that may help them to survive chemotherapy . Abbreviations: M0, no detected metastasis; M1, metastasis; n, number of patients; RT-PCR, reverse transcription polymerase chain reaction. Controversy also remains regarding the clinical relevance of CTCs versus DTCs. Some authors showed superior performance of DTCs in predicting overall survival in both non-metastatic and metastatic breast cancer patients [32, 36]. In contrast, others reported that CTCs predict overall survival in metastatic patients, whereas DTCs do not . Pierga and colleagues  reported that CTCs and DTCs have identical impact on overall survival of non-metastatic and metastatic patients but disease-free survival is predicted only by DTCs. Simultaneous detection of CTCs and DTCs was shown to be associated with an especially poor prognosis and increased incidence of disease-related deaths in non-metastatic breast cancer patients [32, 34]. Of note, it has recently been reported that counts of disseminating tumor cells vary not only between bone marrow and peripheral blood but probably depend also on the vascular compartment from which blood is being collected . Substantially higher numbers of CTCs were counted in central veins than in peripheral veins. It might be speculated that the numbers of DTCs/CTCs might be site-specific because the microvascular system of different organs might have a variable potency for filtering CTCs/DTCs. CTCs separated from peripheral blood of cancer patients seem to represent a heterogonous pool of tumor cells (Figure 2) with an average half-life of 1 to 2.4 hours . CTCs found in peripheral blood might be apoptotic or viable but most currently applied assays do not discriminate this status. They also do not distinguish cycling and non-cycling CTCs. Both features, however, might significantly influence overall response to therapies. Frequency of molecular markers expressed in circulating tumor cells of breast cancer patients. The shown frequencies are based on data from the literature [21, 26, 33, 42–53, 58, 59, 61–65, 75, 86–91] and they refer to the reported frequency (percentage of total number of circulating tumor cells (CTCs) detected in the particular report) of CTCs positive for the described marker. Markers for which there is more than one report are presented as the mean value and standard deviation of the available data in the literature. Abbreviations: ALDH1, aldehyde dehydrogenase 1; CK19, cytokeratin 19; EC, epithelial cell; EGFR, epithelial growth factor receptor; EMT, epithelial-mesenchymal transition; EpCAM, epithelial cell adhesion molecule; ERalpha, estrogen receptor alpha; Her-2, epithelial growth factor receptor type 2; HIF-1, hypoxia-inducible factor 1; MAGEA3, melanoma-associated antigen 3; MRP, multidrug resistant protein; Muc-1, mucin 1; p-EGFR, phosphorylated epithelial growth factor receptor; pFAK, phosphorylated focal adhesion kinase; PgR, progesterone receptor; PI3K, phosphatidylinositol 3-kinase; SC, stem cell; VEGF, vascular endothelial growth factor; ZEB1, zinc finger E-box-binding homeobox 1. To the best of our knowledge, the first test for detecting viable disseminating breast tumor cells was the EpiSpot, which detects them according to their secretion of CK19 and MUC-1 (Figure 2) . More recently, the addition of the early apoptosis marker M30 to classic cytokeratin staining has enabled assessment of the ratio of viable to dead CTCs  (Figure 2). Expression of the nuclear protein Ki-67, which is associated with cell proliferation, was reported to be absent or rare in CTCs of breast cancer patients [21, 43] (Figure 1), which implies that these cells might display the phenotype of non-cycling, so-called dormant cancer cells. These non-dividing cells might also not respond to some of the currently used chemotherapeutics, as indicated by the fact that a fraction of CTCs survives these therapies (see above). Classic epithelial markers such as EpCAM or certain CKs are frequently not sufficient to detect the entire CTC population in blood . It was reported that the CellSearch® method, based on the detection of EpCam antigen, does not recognize normal-like breast cancer cells, which in general demonstrate aggressive features . Only a method using another marker, CD146 (also called MCAM or MUC18), enabled assessment of reliable numbers of CTCs in advanced normal-like breast cancer patients . One explanation for why CTC isolation based on classic epithelial markers does not detect all tumor cells in peripheral blood is that single antibodies, sold as 'broad spectrum' or 'pan' CK antibodies, do not detect all CK proteins expressed in breast cancer cells ; thus, only appropriate cocktails of CK antibodies increase overall detection rates and reduce the risk of false-negative findings. Recent work on EpCAM signaling  sheds new light on a probable altered phenotype of CTCs. Commercially available antibodies against this glycoprotein recognize only its extracellular domain, whereas EpCAM might be cleaved by proteases, which in turn leads to relocation of its intracellular domain into the cell nucleus. Interestingly, cells with EpCAM in their nuclei but not on the cellular membrane might be oncogenic in vivo . It seems that expression and cleavage of EpCAM is associated with a temporary need for proliferation of tumor cells , which might be essentially reduced when tumor cells enter the bloodstream. Thus, it might be speculated that EpCAM-positive tumors also release cells that lose this molecule from the cellular membrane during extravasation and re-express it only in metastatic sites. Another reason that certain pools of CTCs might be missed during standard epithelial marker-based screening might be their altered phenotype resulting from EMT, currently dynamically investigated in terms of tumor aggressiveness. Epithelial tumor cells under specific external stimuli or with internal aberrations might transform into cells with a mesenchymal or semi-mesenchymal phenotype [9, 49]. Expression of epithelial markers in such cells might be limited or weak, which might lead to false-negative results in CTC tests. Cell lines derived from DTCs isolated from bone marrow of cancer patients indeed demonstrate signatures of EMT, such as low relative levels of epithelial CKs (CK7, CK8, CK17, CK18 and CK19) and increased expression of the mesenchymal intermediate filament vimentin . Several groups investigated this phenomenon in peripheral blood of breast cancer patients using variable EMT-associated markers. 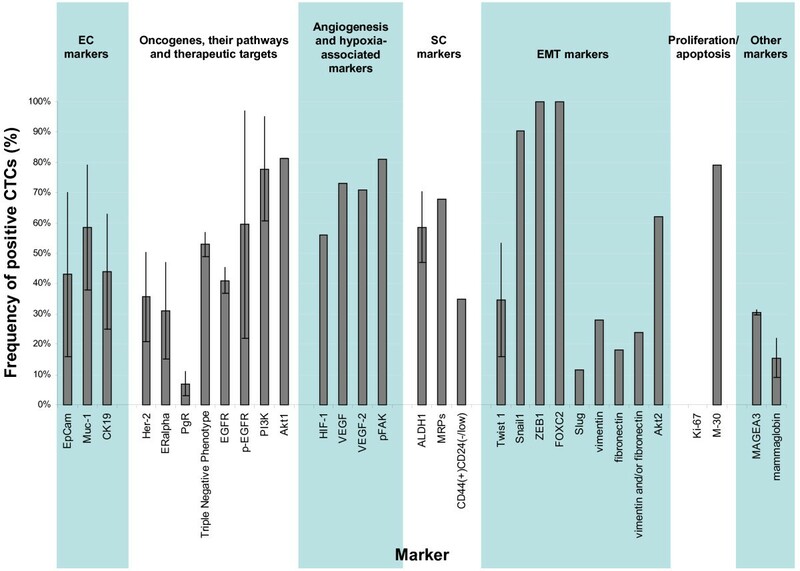 Aktas and colleagues  observed at least one of the selected EMT markers (Twist 1, Akt2 or PI3Kalpha) in 62% of CTC-positive and 7% of CTC-negative cancer patients (Figure 2). In contrast, another research group using a set of EMT-initiating transcription factors (Twist, Snail1, Slug, Zeb1 and FoxC2; Figure 2) showed that overexpression of at least one of these factors was detected in only 15.4% of patients . Raimondi and colleagues  reported the presence of two EMT markers, vimentin and fibronectin, in both CK-positive and -negative cells in the blood of 28% and 38% of patients, respectively. Similarly, Gradi lone and colleagues  found that fibronectin and/or vimentin were expressed more frequently in CK-negative than in CK-positive blood samples (EMT marker positivity in 55% versus 43% of samples, respectively; Figure 2). Both groups noted no expression of these proteins in blood of healthy donors. These published studies suggest that a pool of CTCs might have a semi-mesenchymal phenotype. It is important to mention that patients receiving neoadjuvant therapy were more likely to exhibit overexpression of EMT markers than those who did not . It was also demonstrated that EMT markers predicted worse prognosis more accurately than epithelial markers and even predicted it with statistical significance in patients with CK-negative blood samples . These results imply that CTCs undergoing EMT might be a population of invasive cells resistant to neo-adjuvant therapy. They also demonstrate that EMT markers such as vimentin might complement epithelial markers for CTC detection, as indicated in prostate cancer . However, vimentin is also expressed in a subpopulation of diff erentiated and/or activated monocytes , which can significantly hinder identification of CTCs in monocyte-rich fractions. Thus, it is apparent that EMT-related markers that are specific for CTC detection are urgently needed. EMT and stemness of tumor cells seem to be linked mechanistically [10, 56, 57]. Consequently, subpopulations of CTCs/DTCs may demonstrate a stem cell-like phenotype. Using different experimental set-ups, (over)-expression rates of the putative stem cell marker ALDH1 in CTC-positive blood samples of breast cancer patients ranged from 46%  to approximately 70%  (Figure 2). As expected, ALDH1 was shown to be associated with EMT markers in these samples [50, 52] and a higher stage of breast cancer . Another group analyzed a total of 1,439 CTCs and determined that 35.2% of CTCs had the stem cell-like phenotype CD44+/CD24-/low in 20 patients and 17.7% of CTCs with the stem cell-like phenotype ALDH1high/CD24-/low in 7 patients  (Figure 2). Considering the cancer stem cell model, self-renewal potency and resistance to variable chemotherapeutics make putative cancer stem cells particularly difficult to eradicate during medical intervention. In concordance, patients with ALDH1-positive CTCs more frequently did not respond to chemotherapy . Recently, it was also demonstrated that CTCs in 86% of metastatic breast cancer patients expressed one or more different multidrug resistance-related proteins (MRP1, MRP4, MRP5 and MRP7), thought to be characteristic for putative cancer stem cells or at least tumor cells resistant to chemotherapy  (Figure 2). The patients with MRP-positive CTCs had significantly shorter time to progression . Currently, molecular diagnostics of cancer patients focuses on primary tumors. However, the tumor mass at the primary site contains both invasive and non-invasive tumor cells, whereas for the assessment of risk of relapse or progression only invasive cells seem to be clinically relevant. CTCs represent a pool of tumor cells that have already spread in the system and are ready to establish themselves in a host organ; they are thus potentially dangerous from a clinical point of view. Dissimilarities between CTCs and their respective primary tumor might influence a patient's response to therapies selected only on the basis of the characteristics of the primary tumor [60, 61]. Discrepancies in the phenotypes of CTCs and the primary tumor are indeed noted relatively frequently. HER-2-positive CTCs were demonstrated to occur in patients with HER-2-negative primary breast cancer and, conversely, HER-2-negative CTCs were observed in patients with HER-2-positive tumors [26, 43, 59, 61–64]. Similar divergence was reported for EGFR , estrogen receptor alpha [59, 65] and progesterone receptor . This phenomenon might be explained by limitations of the used experimental set-ups and methods - for example, omitting clinically relevant but small clones of tumor cells within the primary tumor site displaying aberrant HER-2 gene/protein dosages. However, CTCs might undergo a strong selection during dissemination or systemic treatment and their genomic instability may lead to the generation of new tumor cell clones with phenotypic/genotypic features different to those of the primary tumor cells. In addition, CTCs might also be delivered to the blood circulation from secondary sites [11, 13] and therefore their genotype/phenotype might resemble cells from occult metastatic sites instead of those from the primary site. Taken together, direct assessment of CTCs for therapeutic targets or intracellular pathways interfering with the mode of action of the particular drug may provide valuable information in addition to current primary tumor analyses. A 'liquid biopsy' that can determine CTC yields and characteristics in the blood of cancer patients has the potential to become one of the most promising tests in oncology, equivalent to the blood glucose measurement available for insulin treatment in diabetes patients . The reported data are very encouraging, but multicentre studies including larger cohorts of patients, longer observation periods, more detailed molecular characterization of CTCs and more standardized procedures are still needed in order to estimate the clinical utility of CTCs as an independent biomarker. Future analyses should focus on the nature of CTCs and show whether changes in their counts and properties can predict patient response to specific therapies and thereby complement current diagnostic tests. This work was supported by grants from the Bundesministerium für Bildung und Forschung, the European Commission (DISMAL-project, contract no. LSHC-CT-2005-018911). The authors apologize to all research groups whose excellent work was not acknowledged in the current review due to space limitations. KP has received research grants and speaker's honoria from Veridex. CAP has received honoraria from Veridex. NBK has no potential conflict of interest to declare.